If you haven’t been liking what Raw has been dishing out in the past few months, then you would be loving what’s happening at the blue brand. SmackDown Live seems to have forgotten how to deliver bad episodes now, and with the inclusion of Vince McMahon coming out to deliver some segments, we know where the focus of the company is. 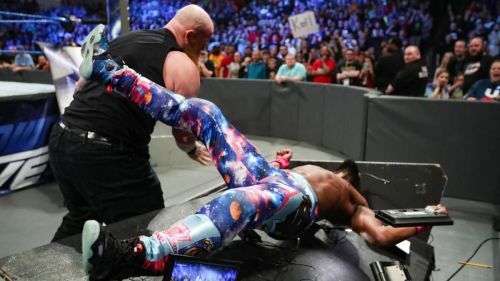 This week once again SmackDown Live was what Daniel Bryan would consider as B+, as we were treated with the night starting with The Miz, intervening with the Kevin Owens show, and ending with an hour of Kofi Kingston. With all the right ingredients, SmackDown managed to move fans and storylines the way it intended to, but there were a few moments that left the fans in shock. In this article, we will look at the 3 most shocking moments from the show, and look forward to hearing yours in the comments section below! The IIconics had been calling out The Boss 'N' Hug Connection to appear on SmackDown Live for weeks. Their calls were answered on this week’s episode. The IIconics finally had their opportunity to prove they are the better tag team in the company, as Peyton Royce and Billie Kay battled Bayley and Sasha Banks in a non-title match. As things have been heating up on Raw for the Women’s Tag Team Championships, with Natalya and Beth Phoenix challenging the champions, and Tamina and Nia Jax proving their dominance, it seems like the scene is about to get more crowded. Lacey Evans once again caused a distraction in a match, which makes one think whether she has been called up as a wrestler or just a distraction. In a shocking turn of events, a superkick from Kay to Bayley laid her out at ringside, allowing Royce to score a roll-up upset victory. Now it seems like WWE will surely be booking a fatal four-way match for the Women’s championship to keep their promise of having the title defended by wrestlers from all three brands.